When Lisandro Alonso presented his new film Jauja at one of the big festivals last year (I can’t remember whether it was Rotterdam or another festival), critics wrote that the Argentinian director had upped his game. They said the same when Lav Diaz presented Norte, a film which demands a lot less work from the viewer than all his other works. Throughout the film I could see why critics celebrated Jauja . It’s a great film which is based on superb cinematography. Visually, it’s a stunning film. And yet, and yet…there is a but. First of all, however, I need to say that Jauja differs greatly from Alonso’s other films. There is no longer a signature of the director recognisable. This is not necessarily a bad thing, but it is when slow-film directors break with their usual filmmaking (which make their films so captivating) and make them more accessible that critics begin to get interested. In short, there is a pattern behind critics’ choices of what a good slow-film constitutes, and this is accessibility. If they have to use their brain too much, they won’t like it. Jauja is a film, which differs in its structure because it is no longer focused on day-to-day activities. The focus on the “real” has been put aside for the sake of a fictional narrative, which, in some ways, simplifies the viewing process. Fictional narratives come with the promise of entertainment. The depiction of everyday activities, on the other hand, comes with the promise of “boredom”. The shift to fictional film makes it easy to see why critics have suddenly found an interest in Alonso’s film. Regardless of my ongoing suspicion when it comes to critics’ sudden interest in certain slow films, I’m impressed with Alonso’s development. Especially the cinematography of Jauja is superb. The framing, almost a square 1:1, makes for an interesting viewing. Xavier Dolan chose a similar framing for his latest film Mommy but the effect is completely different. In Mommy , the square frame represented claustrophobia and tension. In Jauja , the square framing counters the content of the frames – vast, empty landscapes. Alonso’s depth-of-field supports the magic representation of the landscape, the depiction of characters being in the middle of nowhere. I found that Jauja was similar to two other films. Lars von Trier’s Dogville is one film that popped into my head when I watched Alonso’s film. The set-up within the frames as well as the acting reminded me strongly of the theatrical set-up in Dogville. It often felt as though Jauja was a theatre play projected on screen. I had problems considering myself as a film viewer. It was a confusing experience, but rich because of it. Another film which came to mind was Gus van Sant’s Gerry. 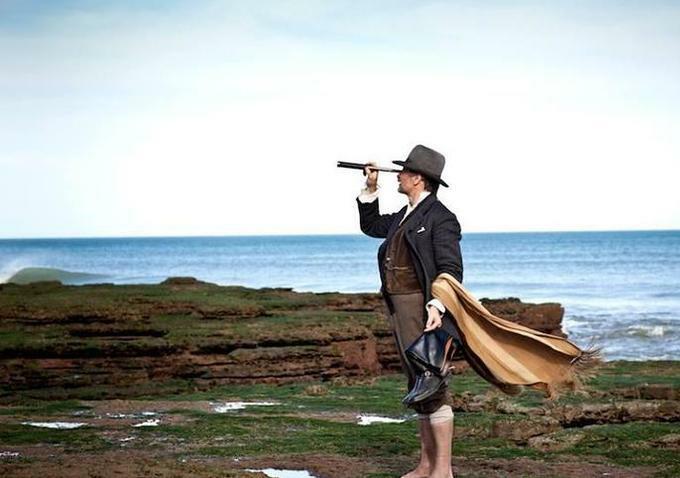 Jauja is a film about a search; a father searches his missing daughter. He walks through vast landscapes, the camera following him or at least watching him from a distant. If there is one film that comes close to the visual feeling (I’m aware this “concept” doesn’t exist, but I cannot describe it in any other way), then it is Gerry. Jauja is the first film by Alonso, which contains clear references to other films, regardless of whether the director has included them consciously or unconsciously. Jauja certainly is a great film, although, while impressed, I’m also a bit wary of how Alonso develops. Of course, changes are welcome, but I hope that he won’t go too far in future. His other films were remarkable because of their sheer observational nature. It felt as though you were part of something. Jauja is a film for the passive spectator (which, again, is great for critics/viewers who can’t be bothered). The film attempts to use memories/dreams as a bridge between past and present. At the end of the film, the film cuts to seemingly present-day Denmark. It is this part which worries me about Alonso. It was unnecessary. Until then the film was superb. The last part completely disrupted the atmosphere. The long-takes suddenly felt wrong. They didn’t work. The narrative was superfluous. The idea behind the link of past and present was good, but the execution was disappointing, given that Alonso has always paid attention to character instead of narrative. Jauja is a departure from this. He shifts his attention to narrative and we will see where this will lead him. lol, what a waste of time. If you want active participation why would bother with film, non deluded people tend favor empirical activities.